Gail has always worked in the arts including music, theatre and painting. While earning her degree in Directing for the Theatre, she did her costume, set and lighting design renderings in traditional watercolor. But it was her family’s five-year experience living in Singapore and Shanghai, China where she fell in love with the Asian style of watercolor painting and the art of Chinese Calligraphy. When returning to St. Paul, Minnesota, Gail was selected to be a docent at the Minneapolis Institute of Arts specializing in the China galleries where she received intensive training in Chinese art history and had access to close-up study of their extensive collection of Chinese calligraphy, bird and flower paintings and landscapes. Gail has been studying Chinese painting and calligraphy now for 17 years. She studied Chinese calligraphy on a weekly basis with master calligrapher, Stephen Zhenpu Mao. She also studied on a weekly basis with master painter, YuDong Shen. Gail enjoys the challenge of working with “The Four Treasures of the Study”, the ink, ink stone, Chinese brush and handmade paper. This type of painting is deep in history and symbolism. Unlike traditional western style painting, it is meant to capture the spirit of the subject rather than its photographic reality. The ink and paper is unforgiving and cannot be retouched once the brush is stroked on the paper. Yet, many happy surprises come of that water-ink-brush-paper interaction. Gail is a member of the Sumi-e Society of America and has exhibited for several years, as well as won awards, in their annual juried exhibitions. Origin story: I lived in Singapore for 2 1/2 years and in Shanghai, China for 2 1/2 years where I fell in love with Chinese art and calligraphy. Techniques: I enjoy working in the xieyi, or boneless style of painting. I think it is exciting to load my brush with water and ink and stroke my brush on absorbent handmade paper and see the results. 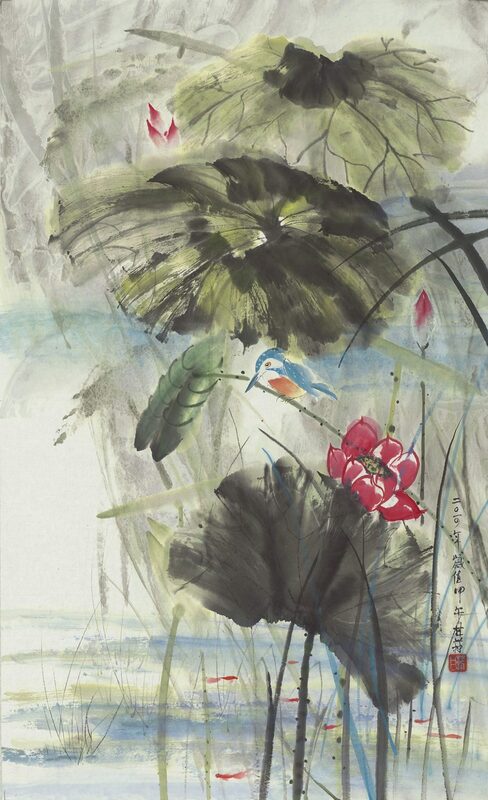 I love to see good brushwork in fine Chinese painting! Art for Sale: You can contact me through a private message on Facebook or e-mail me. Teaching: I regularly teach near the Austin, Texas, USA area and I am available to teach a workshops. Contact me via a pm on my Facebook page, or e-mail me.